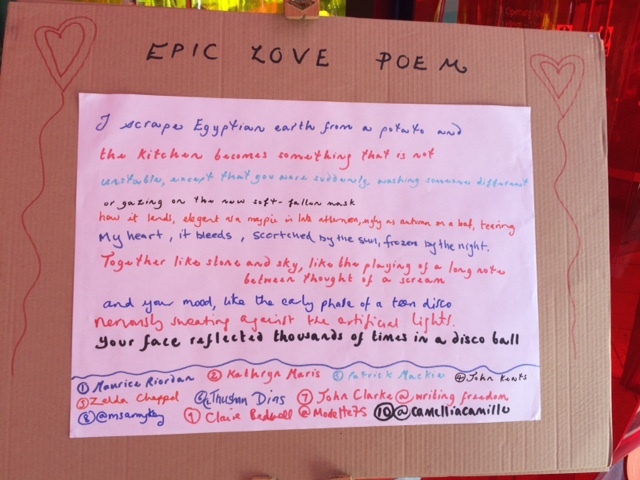 Earlier in the Summer I was asked by the Southbank Centre to design a free poetry activity to run during the Festival of Love. My friend Camellia Stafford was with me when I got the email and we started to come up with ideas, one of which was based on a favourite game we like to play when we’re drinking. (One other idea, ‘Feeling Emojinal’ didn’t pass the test, but I hope I can make it happen one day). 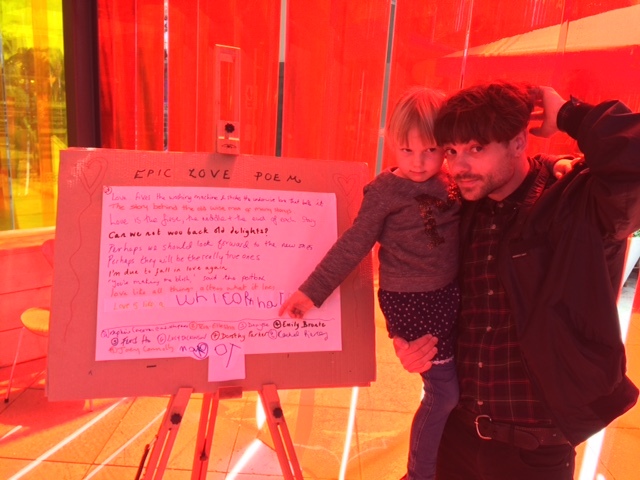 So at the weekend Camellia and I set up camp in the Arcadia Pavilion at the Southbank Centre, and asked members of the public to help us create an epic love poem, which once finished will go into the Poetry Library’s permanent collection and will hopefully go online in its entirety somewhere. The idea was that we’d write one ‘exquisite corpse’ style, with people responding only to the previous line in the poem, and in the process we’d make something weird and wonderful. To get us started I asked Maurice Riordan, Kathryn Maris and Patrick Mackie to write the first three lines. We then added one by John Keats and let the public take it on from there. Love is like a unicorn hat and lilies. 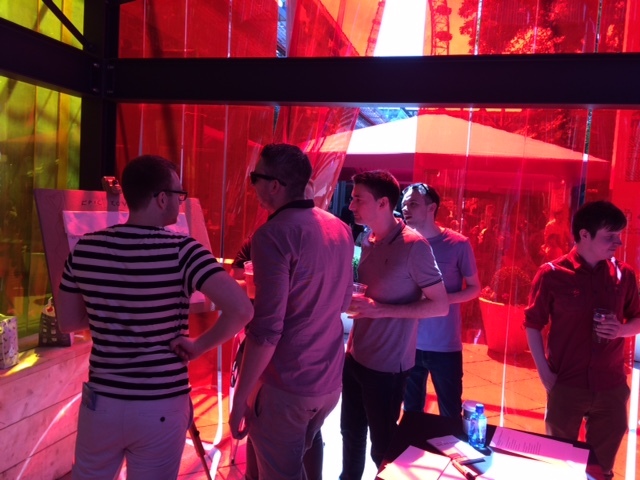 We interspersed them with lines from Rossetti, Dickinson, Yeats, both Brownings. Some of our poet friends popped down to add to the epic (thank-you Rebecca Perry, Crispin Best, Wayne Holloway-Smith, Sophie Richmond and Alex MacDonald). Others texted or tweeted lines for us to use. We spotted Neil Rollinson on his way to lead a poetry workshop & persuaded him to join in. Occasionally we slipped in ones of our own and in a POEM GOES GLOBAL moment, received a contribution from editor of POETRY magazine, Don Share. 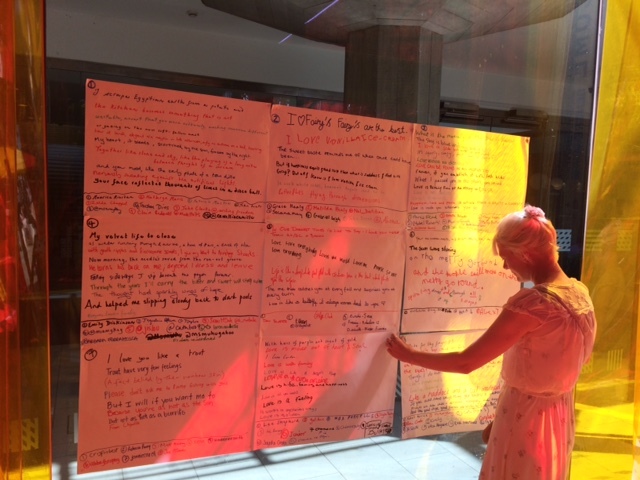 By the end of the second day we had over 18 A3 pages of poetry, tacked up on the glass wall of the Royal Festival Hall – our guess is we have around 200 lines so far – not quite an epic yet. But what it lacks in epic scale, it surely makes up for in number of authors! This coming weekend I’m doing it all again and will be joined by poets Emily Hasler (Saturday) and Alex MacDonald (Sunday). Come to see us between 11am – 4pm Sat 11 & Sun 12 July or tweet me @msamykey to contribute to this very strange and lovely thing.